Spend several nights at a sea turtle project on the Osa Peninsula, located on the Pacific Coast, where you’ll work side by side with local researchers on assist with in-water monitoring and tagging of turtles. Your volunteer work will also include reforestation and mangrove clean up. From the Pacific Coast, you’ll head to the cloud forest and participate in a mask making workshop along the way. Have a chance to hike in the cloud forest and spot the resplendent quetzal before you head back to the central valley. 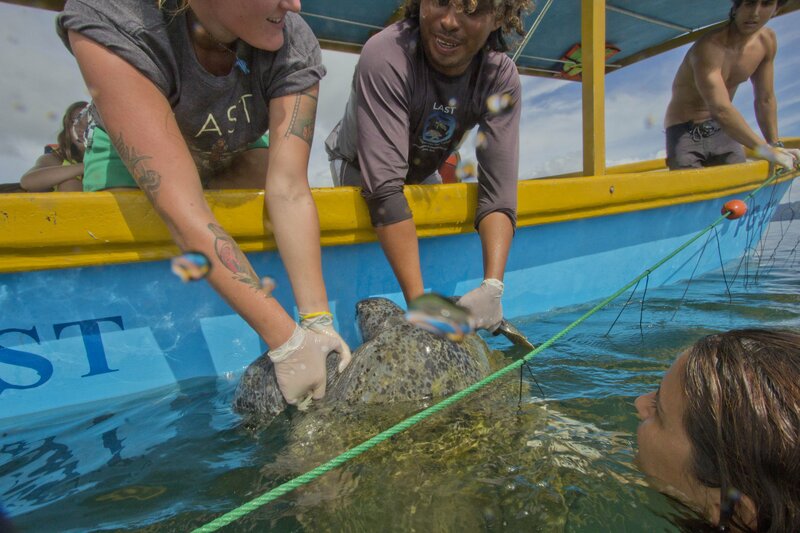 Read the full Osa Sea Turtle Service Trip itinerary. Work side by side with scientists as they study, tag and monitor hawksbill and green sea turtles. Participate in reforestation and mangrove clean-up. Have a chance to swim in the bay and get in the water with turtles! Explore the tropical jungle and beaches of Manuel Antonio National Park. Fly through the air on a canopy zipline tour in Turubari Tropical Park.